Pittsburgh's evolution, from Native American settlement to strategic military outpost, and "gateway to the West" to industrial beehive, lives on in many of its historic structures. Magnificent bridges, the confluence of three rivers, and the rolling hills of Western Pennsylvania provide a beautiful backdrop to the work of architects such as Frank Lloyd Wright, Henry Hobson Richardson and Philip Johnson. Some of the most beautiful architecture in the nation can be found in the Pittsburgh region, including theaters, churches, private homes and jails. Enjoy a pictorial tour of some of the best architecture Pittsburgh has to offer. 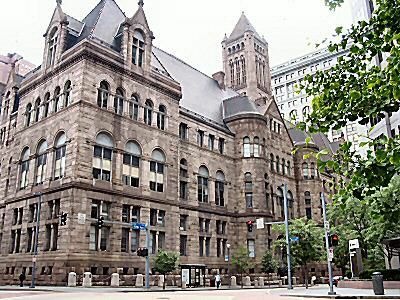 One of downtown Pittsburgh's most distinctive buildings is the Allegheny County Courthouse, designed in 1883 by renowned architect, Henry Hobson Richardson. The architecture of the Allegheny County Courthouse is characterized by the classic symmetry of the Renaissance, with Romanesque details, including Syrian arches, Byzantine Capitals, late French Gothic dormer windows and French Renaissance roofs. Don't miss the frescoes on the first floor, the grand staircase near the entrance to the old law library, the beautiful fountain in the central courtyard park, or the "bridge of sighs" connecting the courthouse and former jail (now a court facility). If the Allegheny County Courthouse's gothic exterior looks eerily familiar, it is because jail scenes for the movie Silence of the Lambs were filmed there. This courthouse is actually the third in the history of Allegheny County, commissioned by the county after the second courthouse was destroyed by fire in 1882. Richardson's design was chosen in January, 1884 for its clarity of design and organization. Construction on the Allegheny County Courthouse and Jail complex began in 1884. Work on the jail was completed in 1886. The courthouse was completed in 1888, Unfortunately, Richardson died in 1886 and did not live to see his masterpiece completed. Although there have been innumerable alterations to both the Allegheny County courthouse and jail over the years, these impressive buildings have withstood the test of time and remain powerfully expressive structures enjoyed as architectural masterpieces. The jail, which was officially closed in 1995, has been masterfully converted into a new combined home of the juvenile and family sections of the Common Pleas Court. The restored and readapted facility has won many national and international design awards. At one time used to transport prisoners from the Allegheny County Courthouse to the Jail, the Bridge of Sighs mimics the original in Venice, Italy. The distinctive Bridge of Sighs is just one of many architecural highlights of the building which Henry Hobson Richardson considers his best work, the Allegheny County Courthouse & Jail in downtown Pittsburgh. The Bridge of Sighs is one of 720 bridges within Pittsburgh city limits, and one of more than 1,700 bridges criss-crossing Allegheny County. Pittsburgh has more bridges than any city in the world except for Venice, Italy. Photo by Terry Way. Provided by Commonwealth Media Services, 1996. Called "the best all-time work of American architecture" by the American Institute of Architects, Fallingwater is a private home designed by Frank Lloyd Wright. Fallingwater, located about 1 1/2 hours south of downtown Pittsburgh, was designed in 1936 by renowned architect Frank Lloyd Wright as a weekend retreat for the family of Pittsburgh department store owner Edgar J. Kaufmann. The beautiful house, constructed of local sandstone, reinforced concrete, steel and glass, epitomizes man living in harmony with nature. Even more beautiful is the setting, including the waterfall over which the house is built. Fallingwater is the only remaining great Frank Lloyd Wright house with its setting, original furnishings and artwork intact. Over 2.7 million people have visited Fallingwater since it opened to the public in 1964. At the turn of the century, when railroads were considered a fashionable way to travel, the Pennsylvania Railroad erected the Union Train Station in Pittsburgh. The Pennsylvanian Union Train Station, designed by Chicago architect Daniel Burnham, features a masonry exterior, marble floors, ornate terra cotta and plaster work, a central atrium covered by a large skylight and a spectacular entry rotunda. The beautiful example of early 20th century architecture is located at Grant Street and Liberty in downtown Pittsburgh. The Pennsylvanian Union Station underwent a massive renovation in 1987 and is included in the National Register of Historic Places. The upper floors serve as a 12-story luxury condominium building, with the first floor serving as special events space. Amtrack still runs trains out of the basement of this magnificent structure. This Flemish-Gothic style building was built by Henry Frick as a shopping arcade, known as the Union Arcade, with 240 shops and galleries on four levels. Lively terra cotta dormers and ornaments decorate the steeply pitched mansard roof of the former Pittsburgh Union Trust Building, above which rise two chapel-like mechanical towers. The interior is organized around a central rotunda capped by a stained-glass dome. This building was built on the site of Pittsburgh's nineteenth-century Catholic cathedral. The architect, Frederick Osterling, was one of Pittsburgh's premier architects, and also designed the Arrott Building (1901-02), and the County Mortuary (1901-03). It was built between 1915 and 1917 and is now known as Two Mellon Bank Center.